With the Buffalo Bills potentially considering a QB in the 2018 NFL draft, we will keep an eye on the QB’s that may be first round picks next year. Expect updates all year long on how these prospects progress. To start, let’s give a brief overview of what is considered a great QB class. Number one on my board coming out because of two things: his presence in the pocket and his ability to throw people open. These traits were on display in last year’s Rose Bowl performance. USC took off when he took over four weeks into last season. He only has ten starts under his belt, but I can see the comparisons to Andrew Luck. His poise while under pressure is the number one comparable. 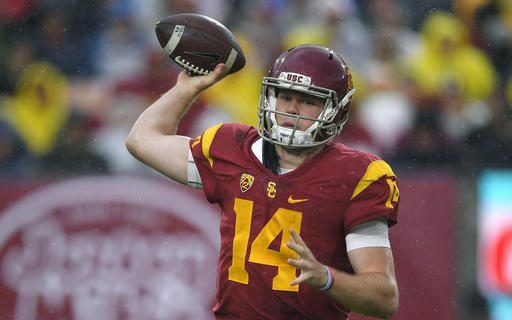 Darnold had a 101 QB rating while under pressure last year. The only negative I can see is some teams may not like his long delivery. September Games to watch: 9th vs Stanford and 16th vs Texas. Number two QB because of his high ceiling and potential. Some scouts see the next Derek Carr in Allen’s game. He can make all of the throws and is the best QB in the class while throwing on the run. His arm strength is off the charts. The reason he’s not number one on this list is accuracy rate. I believe his accuracy could improve with better footwork. This would cut down on his interceptions as well. He has a few big games in September to prove himself: 9/2 vs Iowa and 9/16 vs Oregon. Rudolph is rising up the boards after being considered the second best QB in his state last year (Baker Mayfield-Oklahoma). I see a pure pocket passer in the NFL that can throw the deep ball with the best accuracy of any QB coming out in this class. He’s very accurate and can throw the ball with zip outside the numbers. His game really relates well to Sundays. I like that he is a three-year starter with the most experience of anyone in the top of this class. Big September games: 9/16 vs Pitt, 9/23 Vs TCU. Jackson had an incredible year last season and took home the Heisman trophy. He rushed for almost 1,900 yards and 21 touchdowns. When you see Jackson you can’t help but think of the next Michael Vick. Like Vick, his ability to throw from the pocket will dictate how successful he will be on Sundays. He raised his completion percentage a few points from his freshman to sophomore seasons from 54 to 56 percent. Louisville fans hope he will take another step forward in this area. Jackson’s has great potential. He does make some NFL type throws, meaning good velocity on the ball into tight windows. Key September games: 9/9 North Carolina, 9/16 Clemson. Others we will keep and eye on for you: Luke Falk – Washington State, Baker Mayfield – Oklahoma, and Jake Browning – Washington.